Positioning your tank underground isn’t an intuitive choice. You probably worry about a million different things, both realistic and otherwise. For example, underground tanks are rarely located below the house, so they’ll be somewhere else in the yard. They might lie beneath the driveway, garden, or swimming pool, so it’s reasonable to assume they could cave in when your neighbour parks their truck, or when the kids play jump-rope. That said, the bottom of the pool is already reinforced to prevent crumbling, so your tank is safe. Its own bottom needs to be pretty solid though, because it’s supporting the mass of two water … masses. Also, tanks beneath ground level need efficient pumping systems to push the water to the surface when needed. Now then, how do you prepare your site for the coming tank? Site-prep is the same regardless of the material used to make our tank. Your preparation is driven less by tank components and more by the size and shape of your tank. These will determine the depth and width of your hole. If your tank is already built and needs to simply be lowered into place, then you need 50cm to 60cm of room on either side of the tank, and well as 75cm above it. Below the tank, you’ll need a base that is about 75cm as well, depending on the material you will use. The slab can be loose sand or poured concrete. It needs to be flat and level. Start by selecting your tank location. Clear the surface to remove any rocks, stones, or shrubs. If there are trees nearby, consider whether you want to uproot them. Tree roots are stronger than they look, and because they’re below the surface, you can’t accurately tell where they’re growing. If they stretch towards the tank’s position over the years, they could grow right through your tank’s walls and you’d never know. Once the surface is smooth and free of visible debris, start digging the hole, leaving the required space around the tank. Your tools will be determined and soil type. Rocky ground may require a bulldozer, and sticky clay soil can be hard to get through. Don’t discard the soil and stone you’re pulling out of the ground, because you’ll need to use it later. Some of it will be poured back into the hole once the tank is in position. As you dig, think about any accessories the tank will need, like pipes, pumps, and vents. Those will affect the structure of your hole. 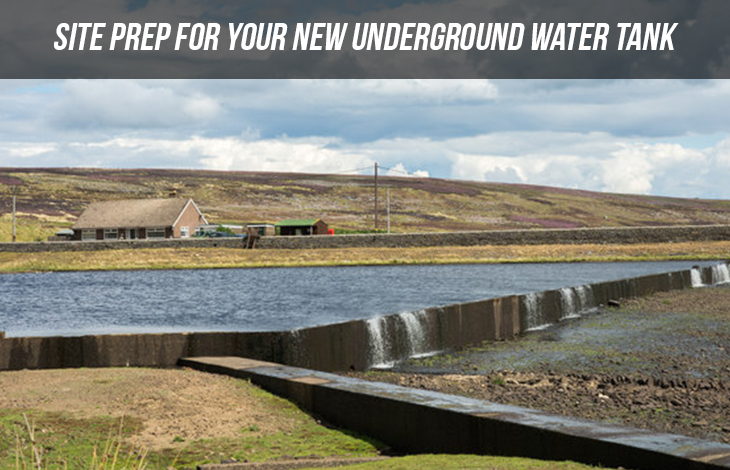 For example, you may need to dig tunnels that will hold pipes leading to the house, or plumbing systems connecting your house to municipal mains. The sides of the holes don’t have to be even or flat, but the bottom does, so when you’re done excavating, pack it tight and reinforce it. You can pour concrete reinforced with steel. 15 cm is adequate. Option two is fine sand, though you need about a foot of that if you’re not going to bind it with cement. Concrete and sand are good options because they don’t have jagged edges that will pierce the tank. Think of touching the tip of a pin vs having your hand jammed down. It’s the same theory, because once the tank is positioned and filled with water, the weight will press down on the smallest, dullest stone with ramming force, puncturing the tank even if the stone wasn’t that sharp. Another reason why the surface needs to be flat is earthen movement. We don’t feel it, but the earth never stands still, literally. It’s rotating on its axis and spinning in orbit. Its core plates are constantly sliding and shifting. And water is heavy, so any tilt of the tank, when combined with moving rock tables and heavy water, could shift the soil around the tank and cause it to collapse, with potentially disastrous results. Now that your base is flat and your foundation is solid, your site is ready. Your tank can be lowered into place and the hole refilled, or if you’re constructing the tank on site, you can form the walls of the mould. Don’t forget to cure your concrete. It lessens the chances of cracks that could later cause leaks.